Rinnai Australia has officially opened its new manufacturing facilities in Melbourne which will produce and export cutting edge electronic gas and electric hot water systems, ducted gas, air-conditioning and solar renewable systems. The new 68,000m2 site also includes a new R&D ‘Centre of Excellence’, where the company will develop and test new products for Rinnai subsidiaries across the world. 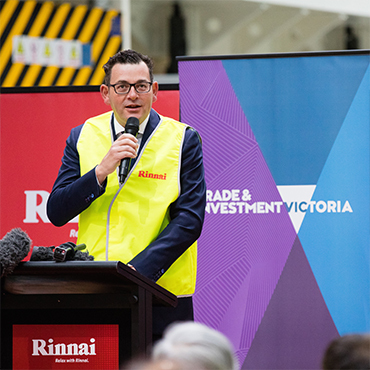 Victoria’s Premier Daniel Andrews, who attended the official opening of the new premises, said the investment will secure the jobs of Rinnai’s existing 380-strong Victorian workforce and create new jobs in Melbourne’s South East. “Victoria isn’t the state of momentum by accident – it’s because we’re working hard every single day to create new opportunities and new jobs,” Mr Andrews added. Greg Ellis, Rinnai Australia Managing Director, said the investment was another significant step towards expanding the company’s local manufacturing operations following the acquisition of the Brivis business in early 2015. “These are truly exciting times for Rinnai, our channel partners and the Australian market as we increase our ability to deliver new and exciting products through local expertise and manufacturing capability,” Mr Ellis continued.